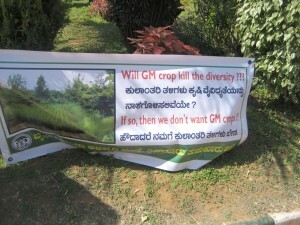 Back in March India debated whether or not to allow genetically engineered “BT” Brinjal (a.k.a. Aubergene / Eggplant) seeds to be sold and planted. India’s national government, through the regulatory body Genetic Engineering Approval Committee (GEAC) had previously approved BT Cotton (which is controversial both because of failed pest control tests and perceived links with farmer suicides). But Monsanto/Mahyco‘s BT Brinjaal would have been the first transgenic food crop approved for release. Having lived in Karnata, India on and off for four years, I was astonished to only recently recognize the diversity of Brinjal grown in India. 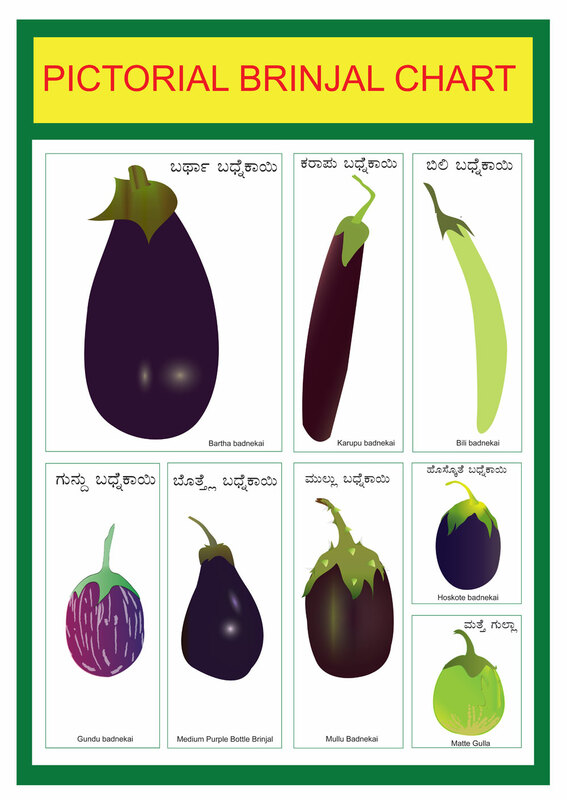 I had seen two or three varieties of Brinjal in the vegetable stands and super markets nearby, but in Karnataka (and most Indian) Cuisine, vegetables are folded into gravies such that they lose their visual markings. (But certainly not their flavor!) 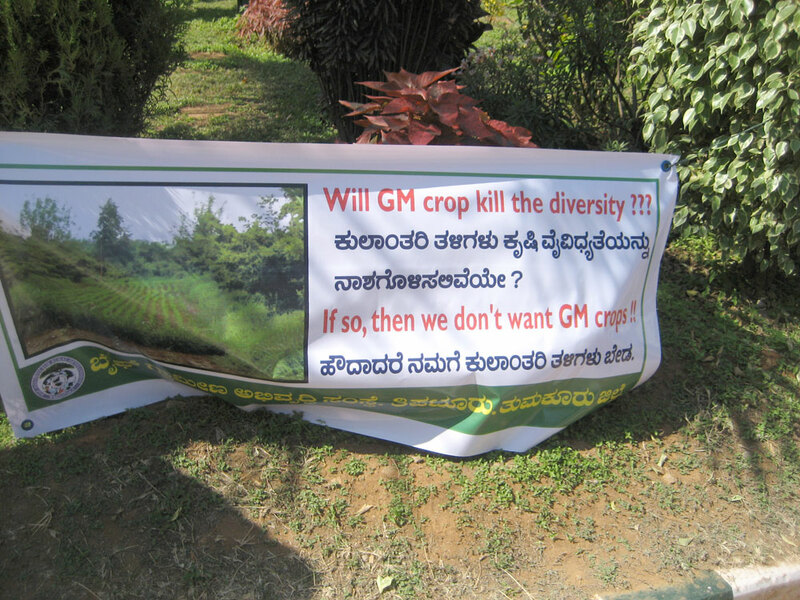 I only first became aware of the diversity of Aubergene when I saw images like this, from citizens protesting outside of the Bangalore debate on BT Brinjal. It turns out that Brinjal varieties and recipes rival the diversity and culinary passions of Americans and their Tomatoes. This is one vegetable fruit that has serious gastronomic relevance in the sub-continent. If BT Brinjal were approved would it quickly become the dominate variety and severely reduce the agricultural biodiversity of India’s food system? I followed the English-language debates in print, and in person, somewhat closely since Janruary 2010, and I had never heard mention of which variety (or varieties) of Brinjal had been transgenically altered, or which ones were going to be considered for approval / up for sale. If I were to guess which variety would serve as the most ubiquitous for sale across in India, I would predict the large purple Bartha. But as shown in the collage below other people imagined and imaged a BT Brinjal made from the medium purple variety with the spike on the stem called: “Mullu Badnekai”. Putting aside the other points of debate about this agricultural technology, I am amazed that the topic of what varieties of Monsanto/Mahyco had engineered and field tested never came up. No matter what food system one is talking about, even eaters without food security feel an attachment to the varieties, recipes and rituals that have existed, and are excited to taste and cook with new foods. How could this simple fact about Genomic Gastronomy not have entered into the debate? I hope I just missed this point and someone can point out the answer to me. The above poster (printable A4 .pdf version here) was completed as part of course on art & biotechnology at the Srishti School of Art, Design & Technology. Thanks to all the students to participated and apologies that our Kannada is imperfect at best. Lecture “Genomic Gastronomy: Food Systems, Security & Policy” at CSTEP (Center for Study of Science Technology and Policy) in Bangalore. vid from genomic gastronomy on Vimeo. In May 2010 the Center for Genomic Gastronomy made a presentation at the Srishti School of Art, Design & Technology in Bangalore, India. The lecture was presented to the Freshman Synthetic Biology (“Teenage Gene Poets”) course led by Yashas Shetty of CEMA who are competing in the iGEM competition at MIT. The lecture introduced the students to the research about food, biotechnology and culture the Center for Genomic Gastronomy is engaged in. Center for Genomic Gastronomy lecture given by Zack at the conclusion of the Interactivos? workshop at the Process as Paradigm (catalog) show at the Laboral Centro De Arte, Gijon Spain, in April 2010. How often is the brinjal celebrated? Probably, a few times since the bt brinjal started threatening to flood the Indian market. But when an artiste chose to experiment with it, the brinjal proved to be quite a creative medium. A brinjal cooking contest to celebrate India’s crop diversity conceptualised by Zack Denfield, artiste in residence at Srishti School of Art Design & Technology saw a slew of tasty dishes, served along with interesting information about the core ingredient, brinjal, at Jaaga, an art space in Richmond Town. Seven students, Aratrika De, Bidisha Das, Barath Jayarajan, Karthik Illango, Kavya Satyakumar, Sachin Gupta and Sayad Nooshin, worked with Denfield on this project. 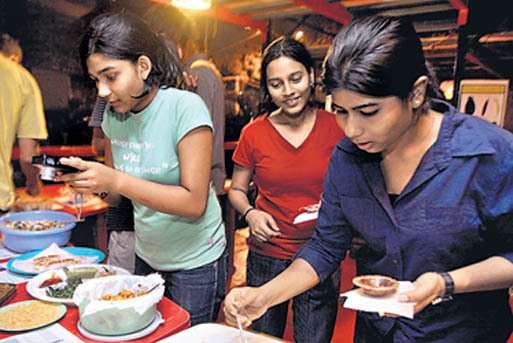 They borrowed interesting recipes of traditional Indian dishes like baingan ka bharta, yennegai badanekai and badanekai thokku, and also cooked up some novel ones. “The contest idea of came with the bt brinjal debate. But then, we didn’t want to talk for or against it, but just demonstrate the crop diversity,” says Jayarajan, who was surprised to find eight varieties of brinjal in the Bangalore markets. 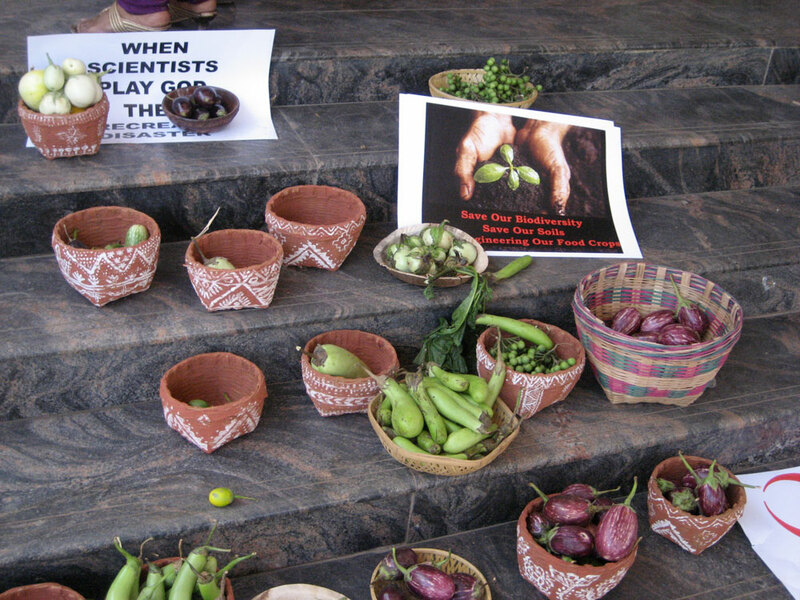 Brinjal 4-Way was a research project and cooking contest created in collaboration with students from the Srishti School of Art, Design & Technology and held at Jaaga in Bangalore, India. For a video of the students’ research please go here (& see below) and to see coverage in India’s DNA newspaper you can go here. (Printable .pdf Posters here and here). cooking contest: Brinjal 4way! from Franken FoodCart on Vimeo.